NOTE: Jefferson Middle School may soon fall to the bulldozers and a loop road will be constructed around the school. This proposal has been pushed through without any public process. If you have an interest in learning more about this issue or preventing it from happening, click the image above to visit HaltTheLoop.com. On the evening of August 14, the renowned urbanist and author Jeff Speck lectured at the Hotel Parq Central. 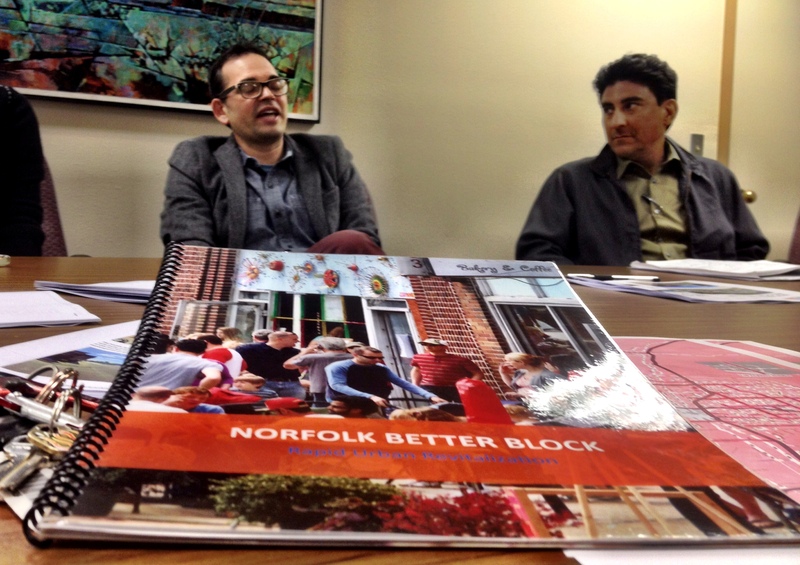 The attendees were a diverse mix of community members including city planners, developers and other interested citizens. Mr. Speck’s ability to speak candidly about the issues facing Americas urban communities was refreshing and helpful. His new book, Walkable City, outlines in detail many of the themes highlighted in his presentation. If you are interested in making Albuquerque or any city more economically sustainable and physically healthier, I strongly recommend this book. It is light on the jargon yet it clearly highlights the ingredients necessary to create cities for people. The next morning, I joined Jeff Speck and a couple of other community members on a tour of Jefferson Middle School. The discussion topic was a proposed loop road around the perimeter of the school. I previously wrote an article about this issue titled Why Don’t Children Walk to School Anymore? Crisis and Opportunity at Jefferson Middle School. We arrived at the school around 8:10 AM during the peak of the morning parent drop-off rush. It was relatively tame on Girard: slow speeds, minor congestion and relatively fluid movement. Once we entered the adjacent neighborhood, the issues became more visible with high volumes of parent drop-off traffic observed. 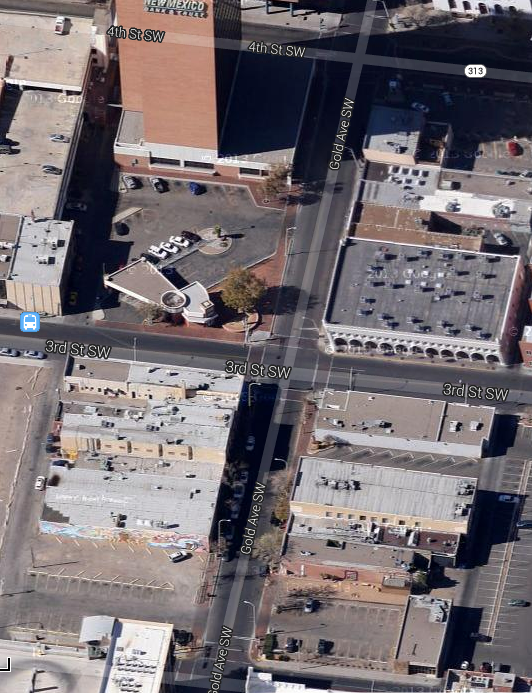 This created potentially dangerous situations for the many students and residents walking or biking on these streets. We parked and entered the school grounds from one of the three walking paths which connect the neighborhood to the school. The loop road plan was briefly explained to Jeff and as we walked he began to draw. Mr. Speck observed that there was very little traffic on Lomas considering it was the peak of morning rush hour. Sure enough, the traffic counts show that this segment of Lomas is overcapacity and does not need three lanes in each direction. For comparison in the image above, observe that Central, highlighted on the bottom of the image with a black rectangle, handles almost twice the amount of traffic (31,200 cars/day) between Girard and University with only two lanes in each direction. I encourage you to play with the large full version of the traffic count map in the image above: 2011 Traffic Flows for the Greater Albuquerque Area. 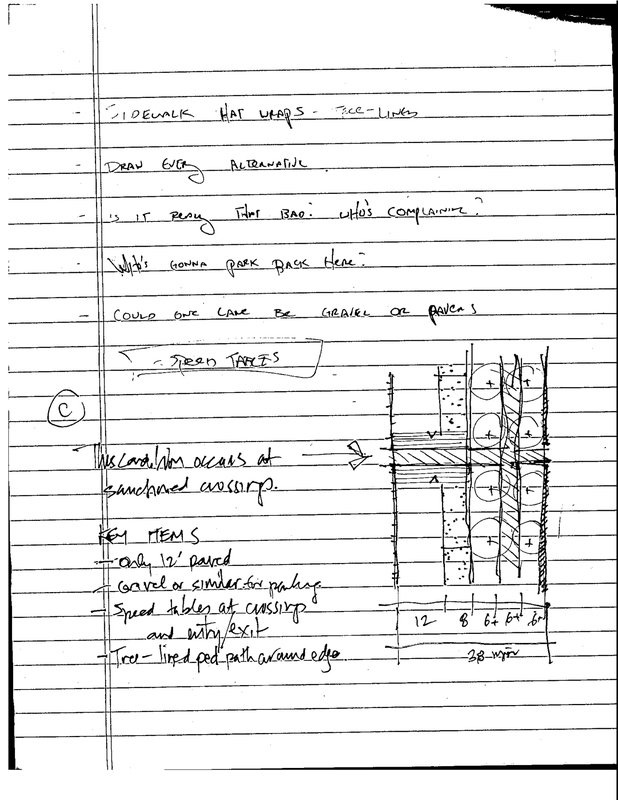 This plan would be both incredibly cheap and physically easy to implement. Regarding physical infrastructure, it would only require a bulb-out (COST: ~$20,000; source) and pavement markings instructing vehicles where to stack, where to turn, etc. Compare this to the cost of the proposed loop road at $572,000. The graphic above explains Option A in detail. As written in the graphic, this segment of Lomas only averages 17,400 cars/day! This volume of traffic could easily be managed with only two lanes vs. the existing three lanes. A major side benefit of this plan would be reduced speeds and traffic calming. 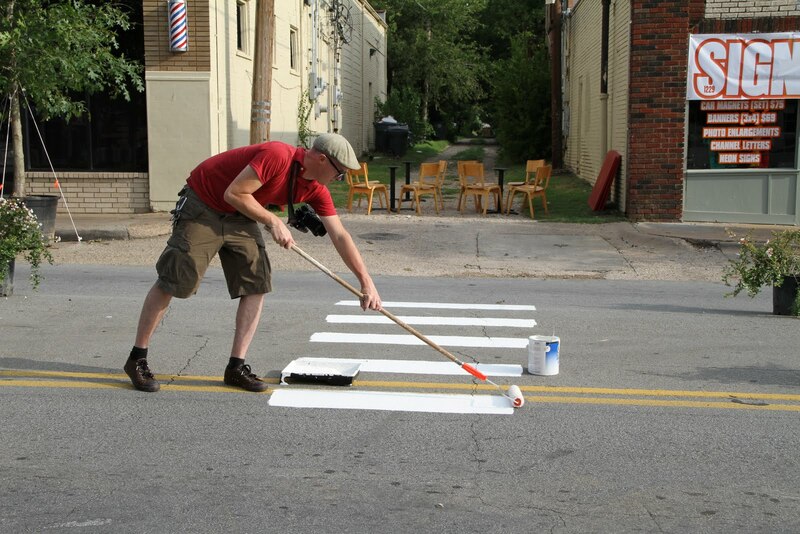 One less traffic lane would give vehicles one less opportunity to pass aggressively, making it safer and easier for people to cross the street. 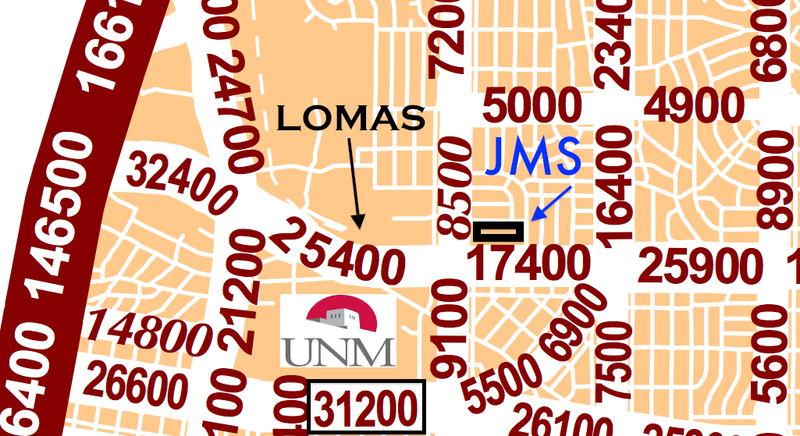 According to neighborhood residents, Lomas is only serviced by four school buses. However, the bus lane is wide and if extended, could easily handle the existing four buses as well as a significant percentage of the parent pick-up/drop-off traffic. The graphic above explains this alternative in more detail. Since this option would involve extending something that already exists, the cost to build it would be much lower than the proposed loop road. 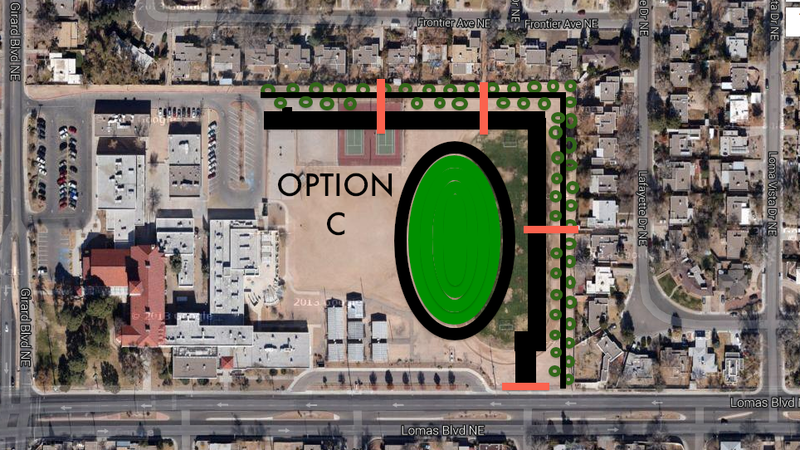 This option, pictured above, would require the least amount of deviation to the existing plan. 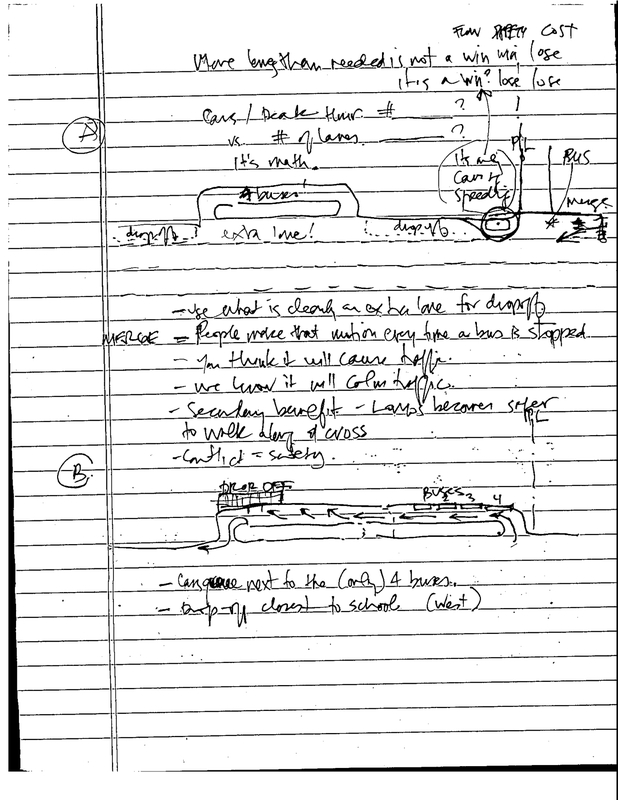 However, the enhancements discussed here would lead to a much higher quality project. A 12 ft. driving lane plus an 8 ft. parking lane vs. the proposed 24 feet of pavement would mean lower speeds plus less storm water drainage issues. The tree lined sidewalk would both reduce the heat island effect of the new road and provide a pleasant walking environment for the significant percentage of students who walk to school. If we think in isolated boxes, we are fixing a school drop off problem by creating a traffic problem. If we think synthetically, we are fixing two problems at once: school drop off and an unsafe sidewalk against speeding traffic. 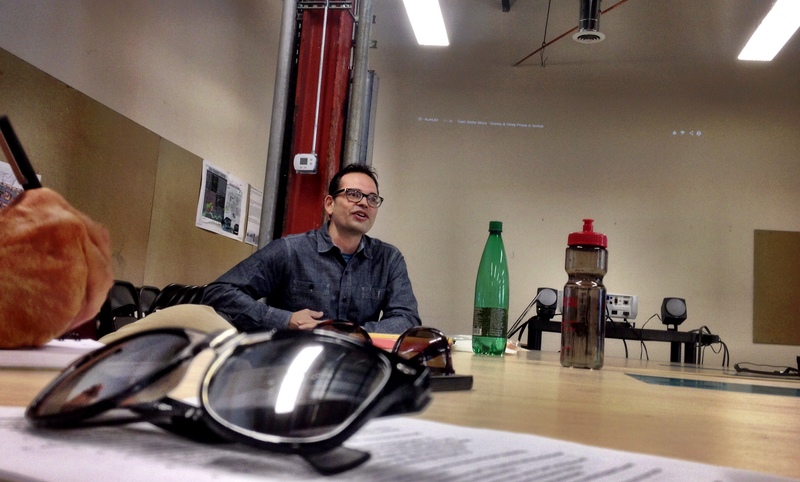 This project is interesting because of the larger context. APS is one of the most influential organizations in the City of Albuquerque. If they do not have an interest in encouraging walkable environments around their schools, the whole city loses. Regarding walkability, schools and children are the lowest hanging fruit. By design, most student live in close proximity to their school, especially if it is a middle school or an elementary school. Encouraging walkability is simply good economics: parking lots and loop roads are a lot more expensive than crosswalks and bike lanes. Jefferson Middle School has a history of students walking and biking to school. Though a significant percentage of students are now attending from outside the district, there is still plenty of opportunity to encourage walking and biking. Since APS does not have to answer to any higher authority, they are acting in a disrespectful manner. They refuse to acknowledge all of the better options that could be used to solve the parent drop-off/pick-up problem. They want the project to be completed and for the neighbors to get out of the way. The city has not yet granted the curb cut that Jefferson/APS needs in order to complete the road but the writing is on the wall. Within the past couple days, fences and other infrastructure have been placed, suggesting an imminent start to this project. It is unfortunate that APS does not want to build a good relationship with its neighbors. It is a missed opportunity and it will leave behind bad blood in the neighborhood for years to come. Come to the Albuquerque City Council meeting tonight (August 19) at 5 PM and speak up for progressive walkable urbanism in Albuquerque! IMAGINE: Central Avenue, from the Rio Grande River to San Mateo, completely closed for an entire Saturday or Sunday. Open lots filled with stages and music. More bicycles, rollerblades, long boards and strollers than you’ve ever seen in your life. People lying in the middle of the street on a mattress. Tall bike riding leotard-wearing youth. Old Route 66 transformed into New Route 66, a street for people. Try to count the bikes! The equivalent of this happened in Los Angeles on Sunday, June 23. Six miles of Iconic Wilshire Boulevard, the traffic and exhaust choked historic Main Street of Los Angeles, was closed to motor vehicles from 9 AM – 4 PM. 2) bring in food trucks, live music, yoga teachers, etc. 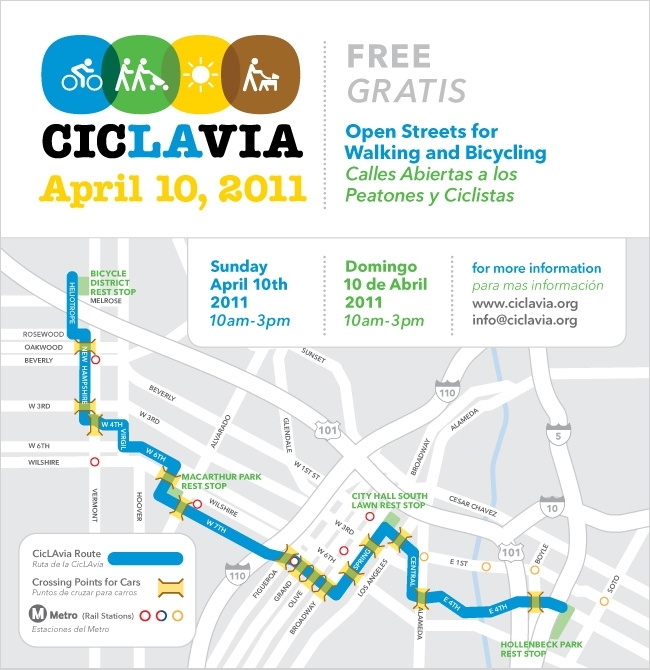 It is based on ciclovia, a tradition that began in Bogota, Columbia three decades ago. The concept is now rapidly spreading across the United States and other parts of the world. Tucson, a city with many similarities to Albuquerque, is now planning its sixth event. An estimated 25,000 people attended the most recent event in April. Read about my experience at the first Tucson ciclovia here. Los Angeles first tried this experiment on 10/10/10. The route utilized side streets that normally had little car traffic. It had public support but many a naysayer. After all, modern Los Angeles is practically defined by car culture. Los Angeles is world renowned for soul-crushing traffic jams, a massive freeway system, fancy celebrity filled Ferraris, Jay Leno’s car collection… you get the idea. 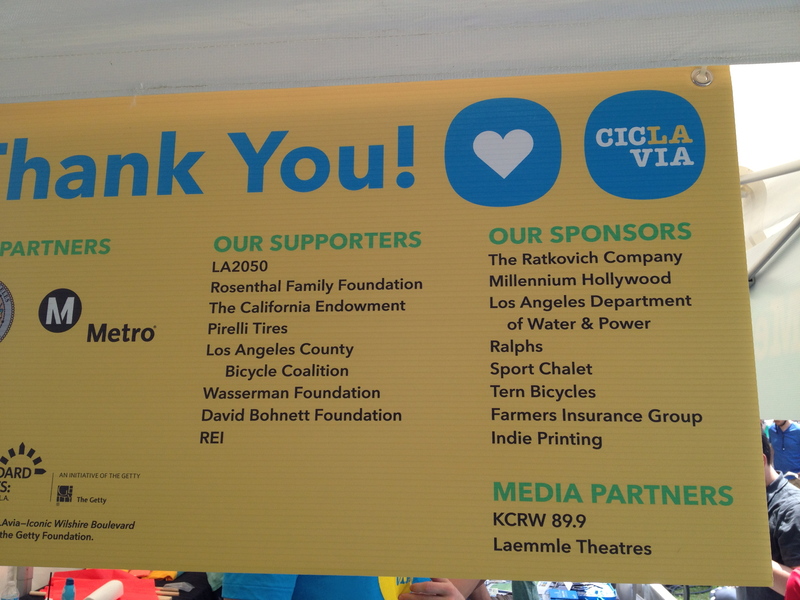 Despite the doubt, the inaugural CicLAvia was a huge success… 100,000 people huge. 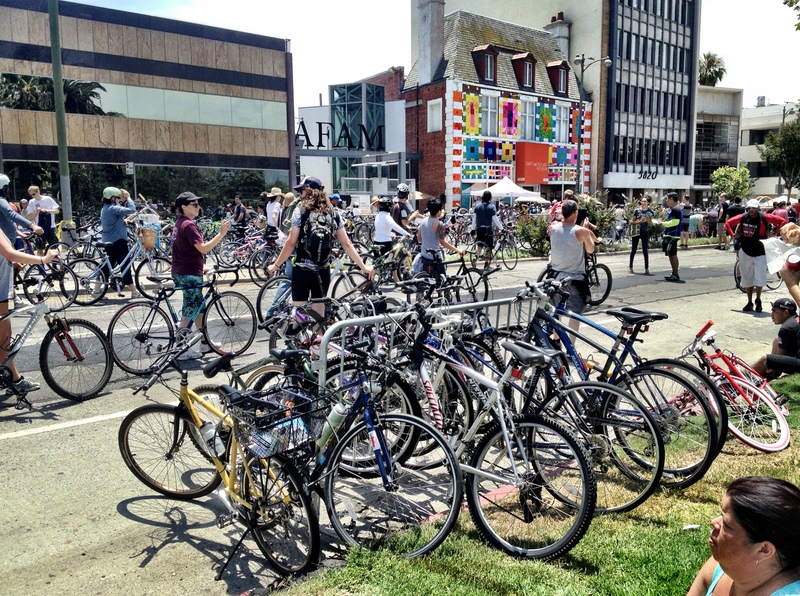 There will be three CicLAvia events on the streets of Los Angeles in 2013. It has a vast array of financial supporters and local champions as shown in the photo below. The event on June 23 was incredible. The route itself included many famous buildings, museums and public spaces best seen at the speed of a bicycle or slower. For the first time “dismount zones”, where people on foot were prioritized, anchored each end of the route. It marked a welcome change in policy since the goal of CicLAvia is to open the streets to ALL non-auto users, especially people on foot. The fact that this route was shorter than previous routes also made it easier to walk the entire distance. Read more about the event here and here. 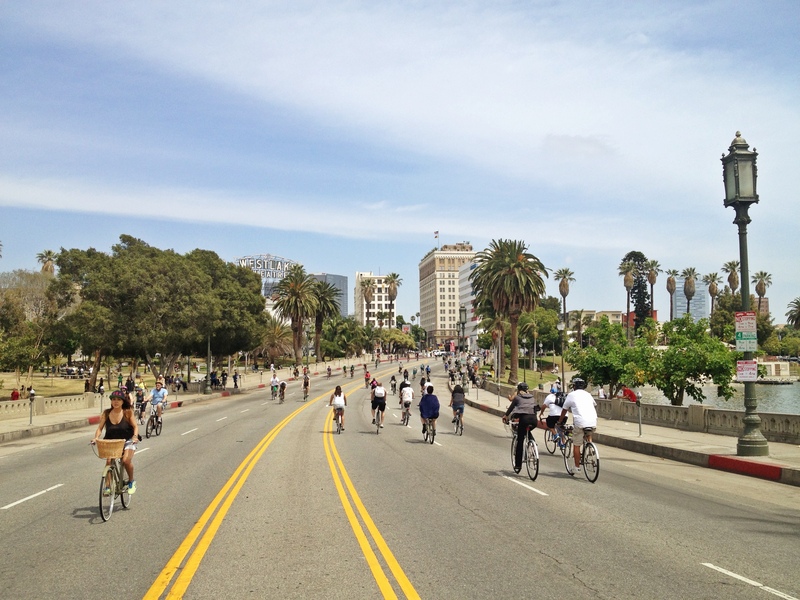 The official CicLAvia website can be accessed here. As someone who was born in Los Angeles and visits frequently, there is change afoot. The Southland is truly beginning to shift its policy and funding priorities towards transit, cycling and walking. 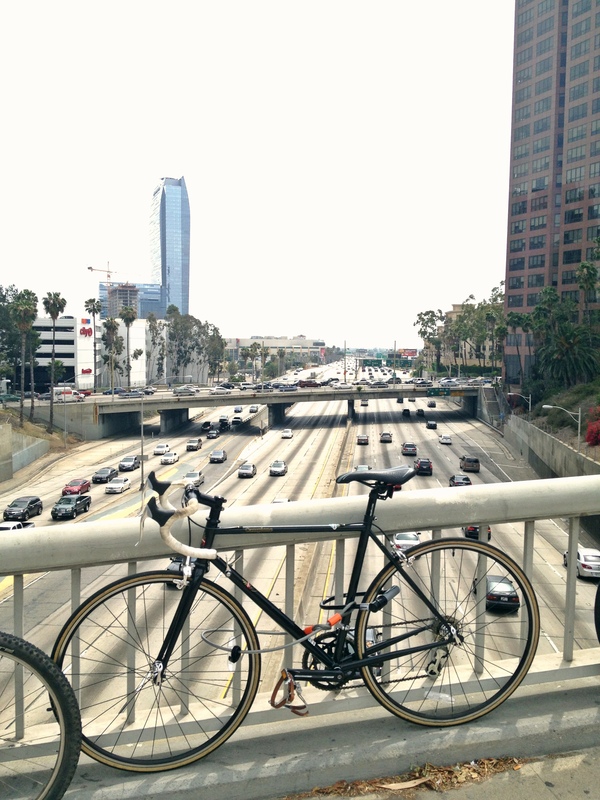 Los Angeles, up until 5 years ago, barely had a bicycle plan. It had little official acknowledgement of bicycles as either a form of transportation or a way to get some exercise and fresh air. The big shift occurred when the outgoing mayor, Anotnio Villagrosa, was hit while riding his bicycle on Venice Boulevard in 2010. Suddenly, doors opened. It’s unfortunate that it takes a crisis but it’s incredible to see the progress since. 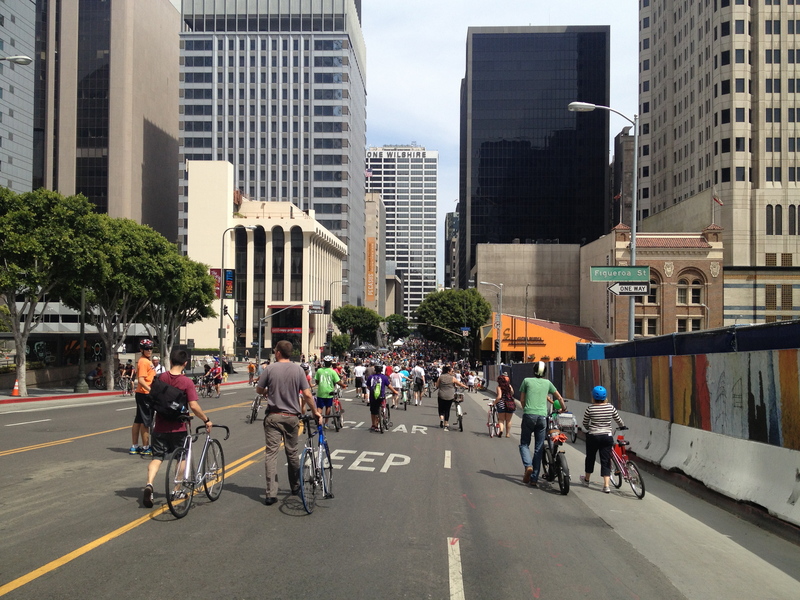 Los Angeles is only one of many cities in the region currently transforming its streets. Long Beach and Santa Monica, both of which will be written about in future posts, are currently the leading the progressive urban awakening in Southern California. The era of car dominance will be looked back upon as an odd blip in human history. For all of time until the past 75 years, every human settlement was built around the person on foot. Even when railroads and streetcars were invented, the city continued to retain this focus. After all, one has to walk to the streetcar station or the railroad depot. It is only with the advent of highly subsidized fossil fuels that our urban areas have shifted into sprawling behemoths connected by 15 lane super highways and dominated by automobile. Los Angeles is THE poster child, the ultimate symbol for a new direction, a new future, a new hope. With two rail transit lines under construction and three about to break ground, the people of SoCal have voted for a future where one can ride a bicycle safely on the streets of Los Angeles for more than one day a year, where you don’t need a car to get everywhere, where walking is a reasonable and safe way to move around the community. Central Avenue and Wilshire Boulevard are two urban corridors experiencing similar transitions. Wilshire recently received designated bus priority lanes. It (like Central) has more transit riders than any other corridor in the city. 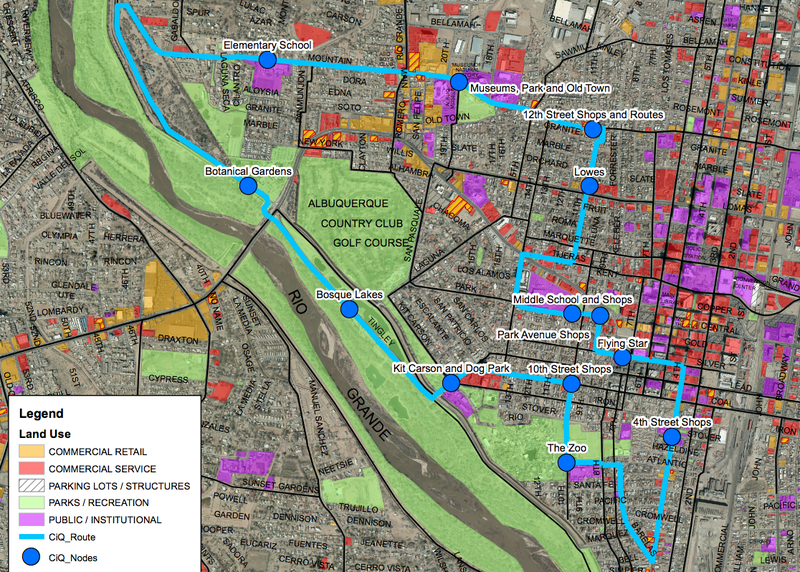 Plans have been approved for rapid transit on the corridor. However, it will be located underground, providing the city with an opportunity to reshape the streetscape dramatically. On Central Avenue, an underground transit system makes little sense based the population of our region. Our options at this point are to do nothing, bus rapid transit (in any variety of shapes or forms), light rail, streetcar or possibly a combination of all of the above. Each segment of Central has a slightly different need and this needs to be acknowledged. This community conversation is beginning to bear fruit but it is missing something: a larger regional vision. Los Angeles is moving forward so rapidly because it developed a regional vision. 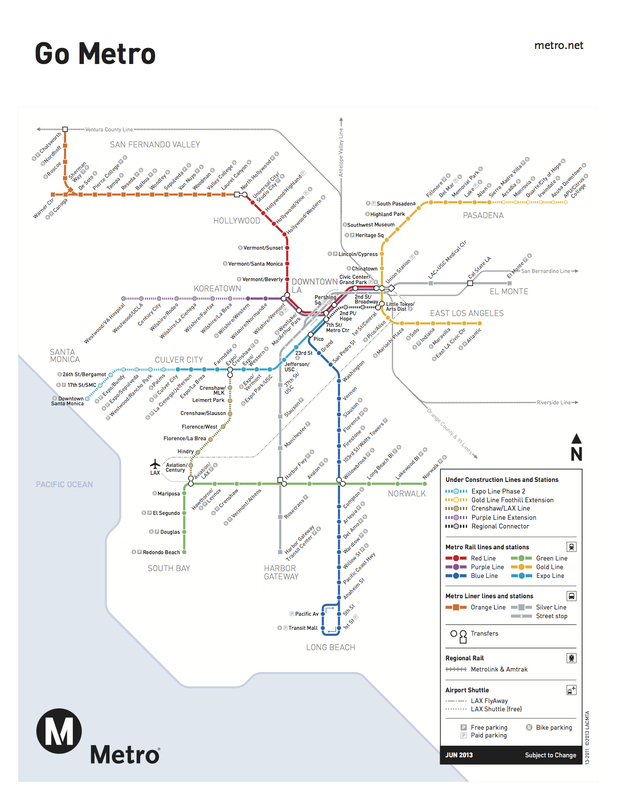 In 2008, the people of Southern California voted for a tax increase called Measure R to fund improvements in transportation around the region. They are not the only metro area which has done this; Tucson also voted on a similar (but much smaller) proposal in 2006 called the Regional Transportation Authority. All over the country, metropolitan areas are voting not to wait around for the federal government. They are deciding to work together to develop a vision for the future of the region. These movements are both bottom up and top down. 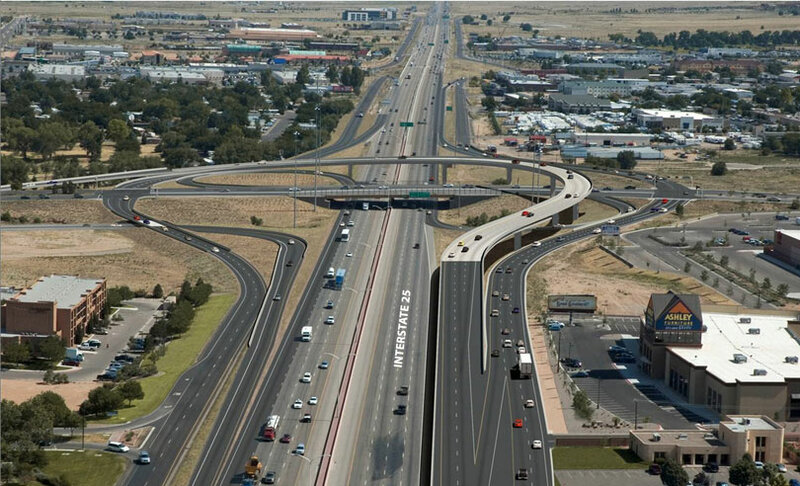 Here in Albuquerque, we recently voted to allocate local bond money to be spent on the Paseo del Norte interchange. This project on its own is not necessarily a bad thing. However, the fact that it was approved in isolation is a disturbing trend. Will we continue to just vote on individual projects as needed? This is a terrible strategy. The PDN interchange should have been part of a larger transportation improvement package. The advantage of a package is projects which would not necessarily be supported independently can be funded when combined with other more popular projects. Also, it allows everyone to get a piece of the pie. For example, the Los Angeles funding measure allocated different percentages of the tax to different pieces of the transportation puzzle: 20% to bus operations, 20% for highway capital projects, etc. An example from Albuquerque could be 20% for BRT, 10% for Rapid Ride, 5% for protected bike infrastructure, 30% for Paseo del Norte, etc. The options are limitless and putting it all together results in a strategy and a vision. In order to progress economically as region, we need to develop an infrastructure investment package. We need to work together to find out which projects are most important, how much they will cost and how they can be a part of developing a 21st century economy. I will be explaining the specifics of my proposal in a future post. Thank you for reading and please comment below!